This March we looked at Bridget Derc’s polymer-covered bottle. This time the UK artist tackled a kleenex box, applying crisp stripes in punchy colors and geometric patterns that tease the eye. See more of her op-art polymer on Pinterest and Flickr and read about her on this gallery site. Dayle Doroshow learned one of her favorite techniques from Kathy Amt at the 1996 Ravensdale conference. You can still see those collaged mokume gane steps in Dayle’s current work (as in this 4″ tile for the FIMO project). She shares the instructions with the StudioMojo folks in a video this Saturday. 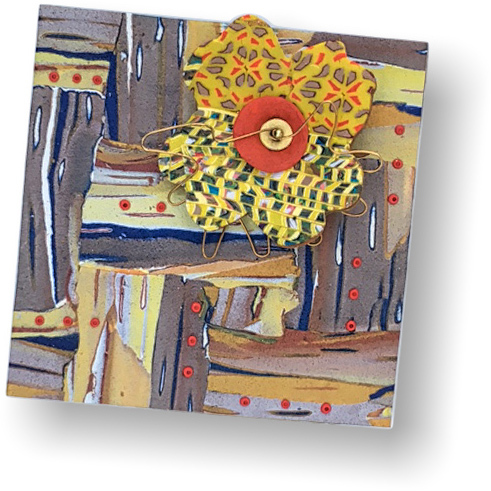 Dayle also added a free Shoe Brooch video on her website. There’s still time to join the StudioMojo fans for a look back at historic tricks that you might not be familiar with. Sign up now.